Say ‘hi’ to Dianara v1.1! Once again, it took a little bit too long, but here it is! Dianara 1.1! 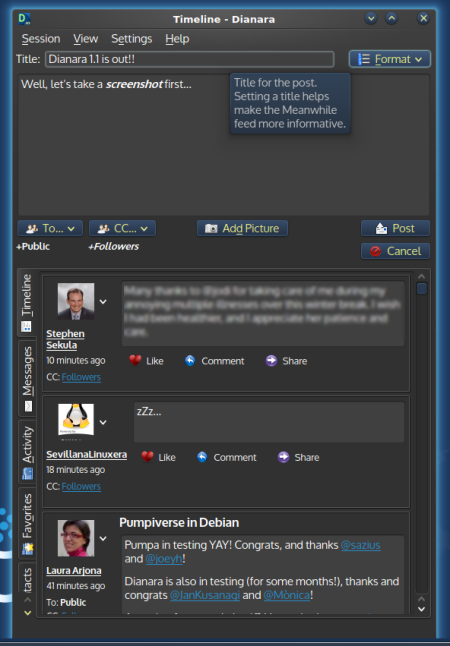 The main highlights of this version are the enhancements in the Meanwhile feed (specially the “+” button to open referenced posts), the filters, and the fact that you can add and remove members from person lists now. The Meanwhile feed now highlights activities related to you. There is a counter for new activities, which are also darker until clicked. Ability to manage members of person lists. 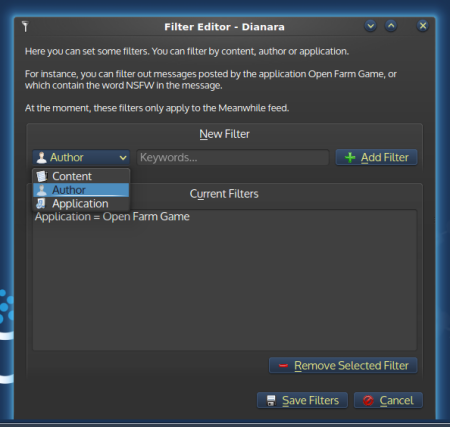 Filters to block activities in the Meanwhile feed containing certain words, from certain users, or from certain applications (like Open Farm Game). Button to get more (older) items in the Meanwhile feed. The contact list gets all contacts now (previously limited to 200). Own posts are no longer counted as new. Some keyboard shortcuts have been hardcoded, so they should work under bare WMs, like OpenBox. Some new shortcuts have been added. Better publisher layout. The option to select different publisher layouts has been removed. Moved “Formatting” button out of the composer. Different posts-per-page configurations for the main timeline and the rest. Option to mark everything as read. Show post’s location, if there is one. Account configuration will show automatically on the first run of the program. The interface should be more responsive now while updating timelines. Option to normalize post text colors temporarily. Some data is stored differently now, so a few things will reset on first use. Lots of other small fixes and enhancements. 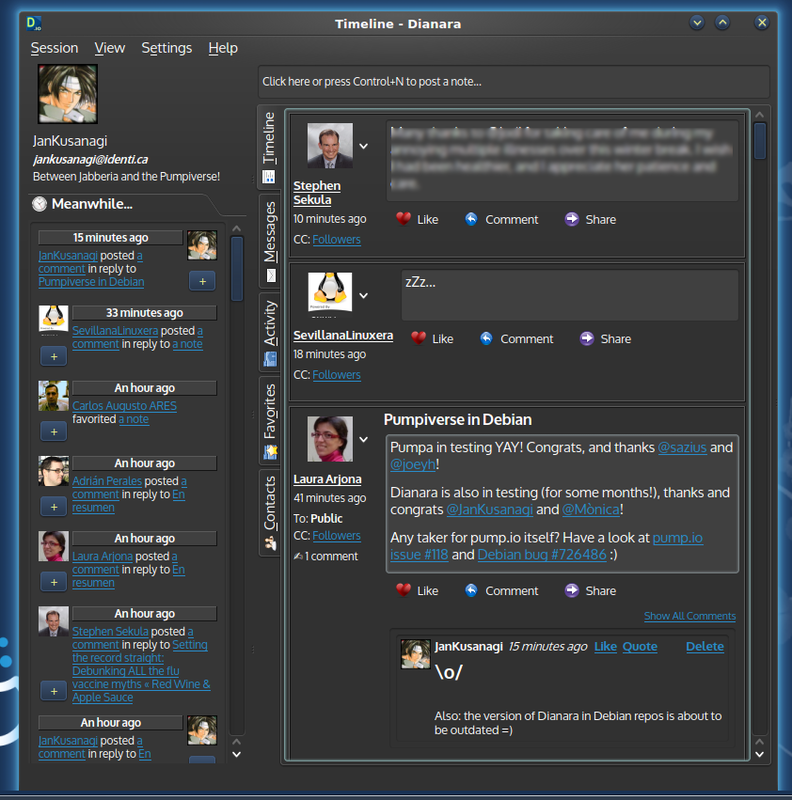 Dianara 1.1 is available in English, Catalan, Spanish and Italian languages. I’ve been told that it might also be coming to Fedora‘s repositories. For now, you can get it from Metal Biker’s repo where you can also find Pumpa, another Pump.io client. You are currently browsing the Jan+KDE blog archives for January, 2014.